Maitreya's Ratnagotravibhaga, also known as the Uttaratantra, is the main Indian treatise on buddha nature, a concept that is heavily debated in Tibetan Buddhist philosophy. In A Direct Path to the Buddha Within, Klaus-Dieter Mathes looks at a pivotal Tibetan commentary on this text by Go Lotsawa Zhonu Pal, best known as the author of the Blue Annals. Go Lotsawa, whose teachers spanned the spectrum of Tibetan schools, developed a highly nuanced understanding of buddha nature, tying it in with mainstream Mahayana thought while avoiding contested aspects of the so-called empty-of-other (zhentong) approach. 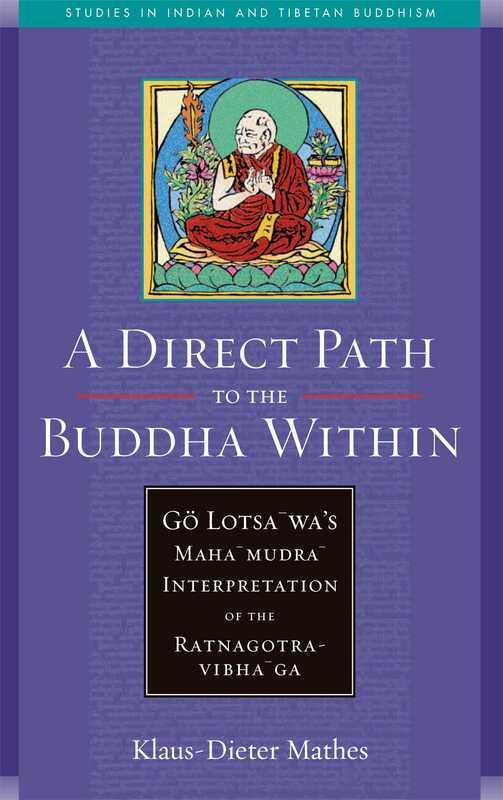 In addition to translating key portions of Go Lotsawa's commentary, Mathes provides an in-depth historical context, evaluating Go's position against those of other Kagyu, Nyingma, and Jonang masters and examining how Go Lotsawa's view affects his understanding of the buddha qualities, the concept of emptiness, and the practice of mahamudra. Klaus-Dieter Mathes earned his doctorate at Marburg University, and is a Professor of Tibetology and Buddhist Studies at the University of Vienna, Austria. He previously worked as a research fellow and lecturer at the Asia Africa Institute at the University of Hamburg, Germany. His research in progress deals with the Indian origins of Tibetan Mahamudra traditions. He is also a regular contributor to the Journal of the International Association of Tibetan Studies. "A fundamental issue for religion in general is how to understand the presence of the sacred in the profane. In Buddhist terms this becomes a question of how to understand the buddha nature that inheres in all sentient beings. Dr. Mathes' study of this issue as dealt with in a late-fifteenth-century Tibetan work is a truly outstanding contribution to this important branch of Buddhist philosophy. He lucidly historicizes a good number of fundamental treatises--their authors, Indian and Tibetan, and their ideas. Mathes' diction is also first rate, rendering his exemplary work easily accessible." "One of the notable achievements of Tibetan Buddhist thinkers was their remarkable synthesis of speculations from the Mahayana stras concerning buddha nature--the inherent potential of beings for awakening--with the esoteric teachings of the mahamudra, the 'great seal' of realization, inherited from the tantric adepts of India. And no single work embodies this synthesis more fully than does Go Lotsawa's unparalleled commentary on the Ratnagotravibhaga, a text so highly esteemed that its authorship was attributed to the bodhisattva Maitreya.Klaus-Dieter Mathes has rendered an extraordinary service to students of Tibetan intellectual and contemplative traditions by editing this singular work in full, and now here providing us with a clear and meticulous English translation of its key sections. His thorough introduction and annotations resolve the many difficult points found herein and place Go Lotsawa's contribution in its proper context in the history of the tradition. In A Direct Path to the Buddha Within, Mathes sets a lasting standard for the presentation of Tibetan Buddhist doctrinal writings."